TECCPO believes that sharpen your tool before achieving your project! Any basic industrial products are inseparable from the support of tools. As a result, TECCPO devotes themselves to combine technology and power into tools to improve the quality of humans' life. -- Still screwing by hand? -- Hard for looking forward a suitable driver bit? -- Hurting yourself when screwing? TECCPO Electric Cordless Screwdriver -- TDSC01P solve all these problems and help to make these works including assembling and repairing furniture, decorating the house easy and comfortable. With a TECCPO Electric Cordless Screwdriver you'll have a better feelings when doing housework. Max Torque 6N.m with 9+1 torque gears provides with more options when screwing and drilling. Adjustable two-position rotation rubberized handle with LED light could be adjusted to terrible work environment. Spindle lock and the forward/inverse switch are convenient and efficient for various operations. 2000mAh Li-ion Top Class battery has longer lifetime and unbeatable run time. It is enough to get you through your housework. 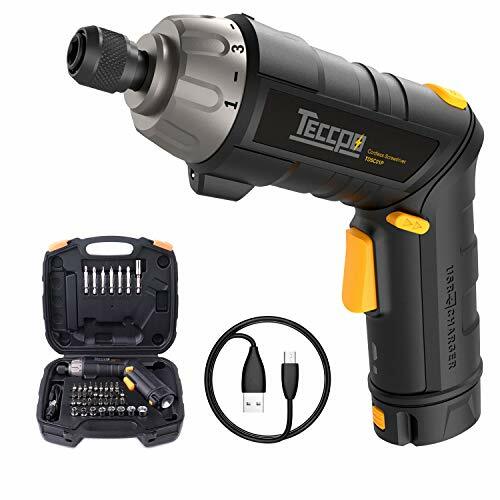 45pcs include a Teccpo Electric Cordless Screwdriver, 34pcs Driver Bits, 8pcs Sockets, 1pc Extension Bit Holder (60mm) and 1pc Socket Connector and 1 USB Charging Cable. 34pcs Driver Bits include 5pcs 50mm and 29pcs 25mm bits. The specification of 8pcs Sockets. Start a new day with a better cordless screwdriver. ▲ HIGHER PERFORMANCE - Power Screwdriver, Max torque 6Nm, more powerful than others in the market. 45pcs accessories including 34pcs Driver Bits, 8pcs Sockets, 1pc Socket Connector and 1pc USB Charging Cable, 1/4 inches（6.35mm）hex allows for quick screwdriver bit change. ▲ MORE FUNCTIONS - 9+1 Torque gears providing more options while Using. Quick release chuck provides a easy way to change the bit and solid connection. Spindle lock with bigger power meets the work requirements of different environments. LED Torch make you find the screws in the Dark. ▲ Easy Charging through USB Charger - Higher Quality 2000mAh Battery means longer lifetime and unbeatable battery run time. It can be charged over 300 times with any standard USB port, Quick Charge Function saves your precious time. ▲ MORE COMFORTABLE - Rubberized rotation handle (adjustable two-position) offers comfortable feeling of grip in confined space and front LED light is designed for dark corner. ▲ EASY CARRY PACKING DESIGN-The blow molding box packing is convenient to carry and store the machine and accessories. If you have any questions about this product by TECCPO, contact us by completing and submitting the form below. If you are looking for a specif part number, please include it with your message.